Nurses are back out on the picket lines tomorrow at four Kildare locations. The third day of protest starts at 8am tomorrow and again runs to 4pm at Naas hospital. The dispute has been widened to include a number of other Kildare premises including, Moore Abbey at Monasterevin and St Raphael’s, Celbridge. The INMO says pickets will also be placed on HSE offices at Beech House, Millennium Park, Naas. Nurses at Naas Hospital say there is insufficient nursing staff deployed there, which means that many shifts are understaffed. This is the nurses first strike in two decades, which began on Wednesday, January 30. They also claim that a beds shortage leads to the cancellation of surgical procedures and that beds are being reassigned to patients coming in through the accident and emergency department. “We just don’t have enough staff to provide a safe level of care; we are relying on agency nurses and you can’t get these at times,” said Caroline Kennedy, chair of the Naas hospital strike committee. Ms Kennedy, who works as a nurse at Naas hospita , said the problem is trying to recruit and retain staff. 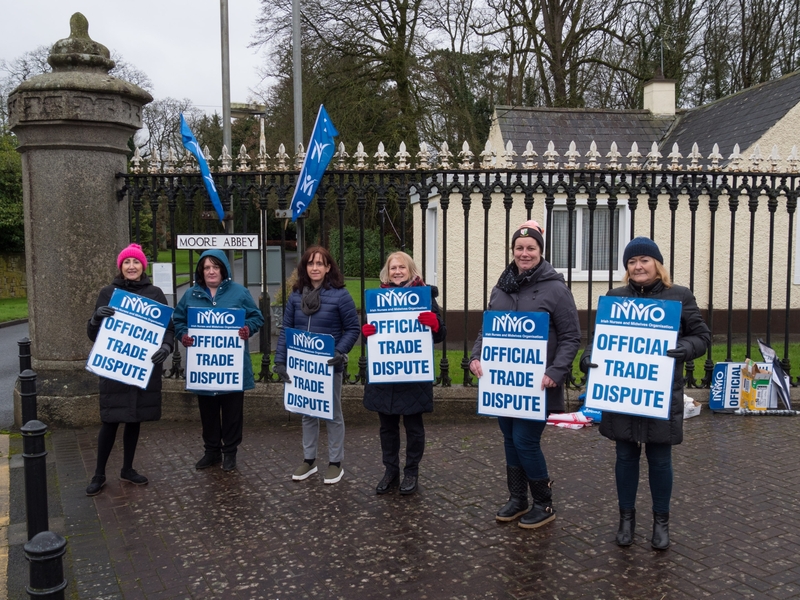 The Irish Nurses and Midwives Organisation (INMO) has been engaging with the HSE for 10 years to find a solution but management has “failed to address the issues.” She said there isn’t a single nurse working at Naas hospital who wants to be on strike. And while there is a will to open more beds, there aren’t enough nurses available to take care of any additional patients. This means there is insufficient staff to provide the facilities proposed under Sláintecare, the Government’s plan to overhaul the health service and provide an overall service within which patients are treated promptly on the basis of need, rather than ability to pay. Some 11 new beds were opened at Naas but most of the additional staff came from the agencies and when it was not possible to staff them, the beds were closed. Ms Kennedy said that while the HSE is trying to encourage Irish nurses working abroad to come home they have been slow to return. “In Australia, for example, there are four patients per nurse while in Ireland the ratio could be seven per nurse up to 15 per nurse and most wards are short staffed every day,” said Ms Kennedy last week. Meanwhile Kildare GPs are joining their colleagues to protest today, Wednesday, outside the Dail to call for a reversal of cuts that have been inflicted on their practices that are, they say, dangerously impacting on patient and doctor safety. Some areas have seen 38% in cuts in resources over the last decade.